On 17 November, the Royal Commission into the Protection and Detention of Children in the Northern Territory will deliver its final report. No doubt there will be tears and finger pointing as the report portrays the reality of a broken system. Note, however, how the words ‘protection’ and ‘detention’ seem to meld seamlessly when we discuss Indigenous children. This article was born when a student asked me what I thought of the media coverage of the Don Dale centre, following the infamous Four Corners program in July 2016. She couldn’t understand the silence in the Territory, nor the fuss ‘down south’. For white Territorians, the fuss over Don Dale was almost incomprehensible. These young black men were responsible for the high level of property crime – particularly in Darwin. The level of punishment wasn’t considered harsh. The young men were simply out of control. The other problem was that people felt sympathy for the Corrective Services personnel. For those non-Territory readers, especially those appalled by the images that night, a few key facts need to be established. 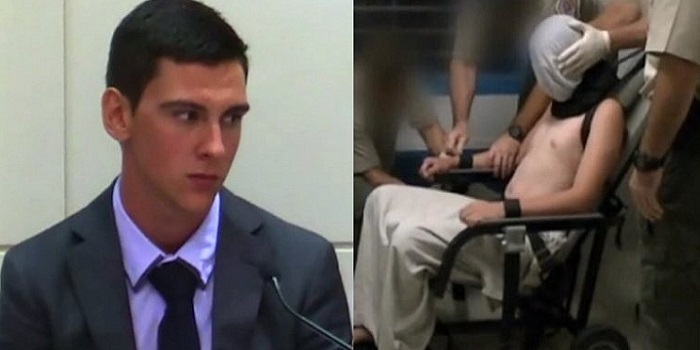 All the vision in the Four Corners story (except Dylan Voller sitting on the infamous restraint chair) had been seen before, on the local TV news. The chair had been debated in the NT Parliament that May, and former Attorney-General John Elferink had the Youth Justice Act amended to allow its use on teenagers as required. Nobody north of the Berrimah Line was shocked. We had seen the gassing and the beatings. There had been numerous inquiries into Don Dale – all saying there were problems and offering no solutions. A couple of months before there had been an uproarious reaction to footage of two ‘inmates’ driving back into the centre through a roller door in a stolen car, in which they proceeded to do doughnuts on the footy oval of the centre while the hapless police pursuers looked on. The tone in the NT News was Keystone Cops, not concern. So while people ‘down south’ were outraged by the Four Corners vision, we weren’t. In fact, what caused any sense of injustice or outrage up here was the fact that the southerners in the ABC had sneaked in and filmed something that, really, was none of their business. Of course, what to tell my student who was actually perplexed about the situation? And so I told her a story about my aunty who lived in the beautiful Macleay Valley on the NSW north coast. Eventually this led to a conversation about Kinchela. Despite a good deal of criticism, much of which is perhaps deserved, the Aborigines’ Protection Board is certainly doing good work in connection with the education and training of aboriginal boys and girls … Mr. and Mrs. A. McQuiggin are in charge, and under their capable management the aborigine and half-caste lads there are receiving a sound training in farm work and husbandry in general with a view to making them available for apprenticeship to farmers from their fourteenth year for a period of four years. A good deal of criticism, but the lads are OK. I am telling this story because it needs to be told. No reason, however well intentioned, will ever justify what happened to us. To say that Aboriginal children were taken away from their parents for their own good is a lie. I was taken over forty years ago, and nothing good has ever come out of that decision. It cannot be overemphasised that these boys at Kinchela are not delinquents. They have been committed to the Home by Order of the Court, because they have hitherto been neglected or have become orphaned, or at the request of their parents. There are those words – neglect, delinquent – which seem to flow so easily, whether it be 1952 or 2017. Time and hindsight make it easy to judge. My aunt did and still does believe that Kinchela was a positive experience for the boys; better than where they came from. She is a great fan of honest history, but then again, sometimes history is too honest. There were stories – then and now – but as my aunt says, there are always two sides. But what she remembers is an acceptance and silence. Among the white population of the Macleay Valley, there was barely a mention of the home: a search of the Macleay Argus through Trove confirms the silence. Silence, protection, detention. Same words, different times. I know I upset my aunt by talking about Kinchela. 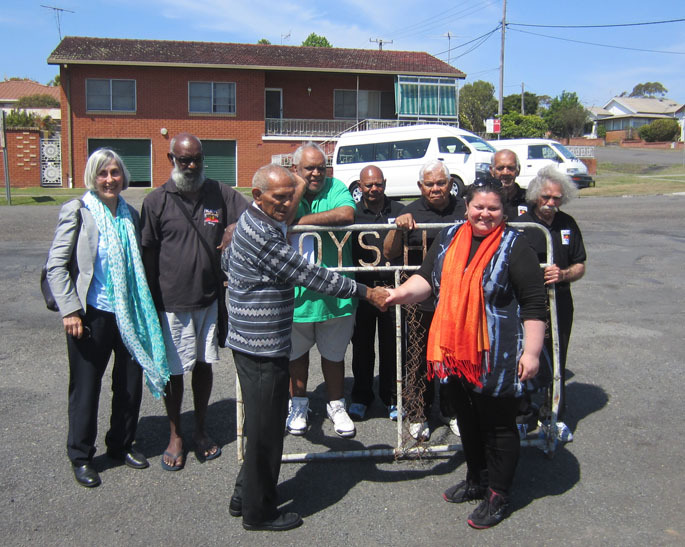 In 2012, a group of former Kinchela boys donated the front gate of the home to the National Museum of Australia. The photo of them holding the gate is a powerful symbol of protection and detention, of removal and dislocation. Likewise, the image of Dylan Voller restrained, hooded, will become part of the Indigenous history of this country. After all the hearings and tears and evidence, it is unlikely the Royal Commission can do anything to undo the trauma experienced by the boys at Don Dale. Dylan Voller is a victim. The Kinchela boys were victims. What the Commission can’t do is to fix in place a culture that sees the detention, protection and removal of Indigenous children as a norm – an unhappy fact, and an almost unavoidable consequence of our incapacity to fix the mistakes of the past and present, no matter how well-intentioned. My aunty taught PE at the local high school for many years and during summer taught generations of children to swim at the Kempsey pool. At the end of our conversation she insisted on me understanding one thing. She pointed out that in the 1950s local Aboriginal children weren’t allowed into the Kempsey or Gladstone pools. The children from the Kinchela home were allowed in as part of their curriculum but only for lessons, not for fun swimming before or after like the white kids. My aunty was successful in convincing the local council that the town Aboriginal children also deserved swimming lessons. For the first time black kids living in Kempsey could have a swim. *John Shield teaches history at Darwin High School. He has written previously for Honest History: how to teach and commemorate Anzac; review of a biography of Chester Wilmot; Top End Anzackery; review of the edited diaries of William Baker Ashton; review of Leigh Straw’s book on the aftermath of the Great War in Western Australia. The imaginary line separating Darwin from the rest of the Territory.